Taking a closer look at the health-preserving, we can see that almost all health-preserving methods are influenced by Yellow Emperor’s Classic of Internal Medicine. They are under the guidance of Yellow Emperor’s Classic of Internal Medicine more or less. In the practice of traditional Chinese health-preserving methods, body regulation, breath regulation, and mind regulation are given great importance. The most important factor is mind regulation, i.e. spirit regulation. The general requirement on mind regulation is serenity, vacancy, and void. In order words, the exerciser is required to achieve systemic relaxation by relaxing the mind. Yellow Emperor’s Classic of Internal Medicine says: “independently adhere to the spirit”, “keep a sound mind”, “and do not get physically overstrained or mentally troubled. Always stay calm and happy. Be content with the environment. 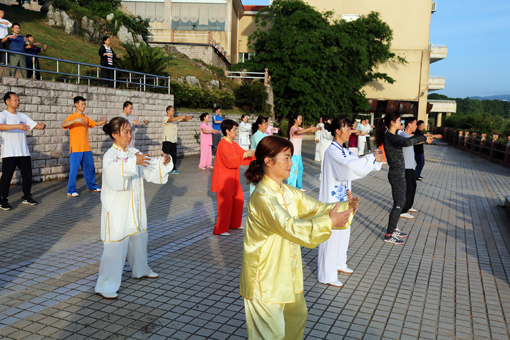 Keep the body strong and the mind focused”, “combine muscles with tendons”, “accumulate essence and complete spirit”, and “freely walk between heaven and earth and listen and look where ears and eyes could not reach” (Su Wen: Shang Gu Tian Zhen Lun). This means we should relaxed both the body and mind through exercise and incorporate this state acquired through exercise into our daily life in order maintain a pacific state of mind. Yellow Emperor’s Classic of Internal Medicine says: “keep a tranquilized mind”, “rest the spirit, reduce lust, stay calm, and keep away from fear”. Whether we “retire to the world” or “stay involved in the world”, we should always “keep away from annoyance and free our mind of worries”. The second element of the exercise is breath regulation. Although there are many breathing methods such as abdominal respiration, thoracic respiration, fetal respiration, turtle respiration, and body respiration, the breath is generally required to be gentle, slow, even, and long in order to achieve the greatest effect with the lest effort. Yellow Emperor’s Classic of Internal Medicine says: “inhale pure air”, “carry the essence and spirit, take in the natural air, and clear the mind” (Su Wen: Sheng Qi Tong Tian Lun), so that “genuine Qi follows the breath” and “circulation of Qi becomes smooth” (Su Wen: Shang Gu Tian Zhen Lun). The third element is body regulation. There are certain rules on the posture of the body both in daily life and in exercise, and especially in exercise. During exercise, the exerciser is generally required to relax the entire body. The ideal state is “muscles and tendons as one entity” in order to “Stay calm and happy. Be content with the environment. Keep the body strong and the mind focused”. In this way we can reach a harmonious state in which a relative equilibrium is achieved between Yin and Yang. “The bones will be straight, the tendons will be flexible, blood and Qi will be circulated, and the muscle and viscera will be tight. A sound skeleton and pure essence will be achieved. And longevity can be expected” (Su Wen: Sheng Qi Tong Tian Lun). Su Wen: Mai Yao Jing Wei Lun contains a line that is helpful for our body regulation, i.e. : “The five Zang viscera are the prime organs of the body. The head is the container of wisdom. If the head is tilted, the spirit will be depressed. The back is the container of the chest organs. If the back is bent and the shoulders are bent, this container will be damaged. The waist is the container of kidneys. If the waist cannot turn, the kidneys will be fatigued. The bones are the container of marrow. One should not stand too long. If one walks too much, the bones will be fatigued. If these organs are strong, the body will be vigorous. If these organs are weak, the body will be dead.” The body cannot be strong unless these five Zang viscera are strong. And proper movements of the body can strengthen the five Zang viscera. This text has described the external signs of a weak body. In other words, if we pay attention to the posture of the body and form good standing, sleeping, sitting, and walking habits, the five Zang viscera will naturally work normally and Qi will freely circulate through them to nourish the five Zang viscera. —Tilted head and eyes : If the head is tiled forward, backward, leftward, or rightward and the eyes look up, down, right, or left during exercise, the posture will impede the circulation of blood and Qi in the Du and Ren Channels. Stagnant blood and Qi will accumulate in the top of the head and result in headaches and dizziness. Therefore during exercise, we are required to “keep the head and neck straight and lift the head as if propping up something”. But the head-lifting force should be virtual instead of being concrete. —Hunchback with feeble arms failing to hold up: If the back is bent, the shoulders are drawn back, bent forward, or lowered too much, the circulation of Qi in lungs will be impeded. The “shrink the chest, straighten the back” of Tai Ji Quan means to straighten the spine of the waist and back under a relaxed state. The exercisers may mistake “shrink the chest, straighten the back” by lowering the shoulders and elbows so that the back between the shoulder blades lump back, the frontal chest is indented, both shoulders are pressed down, and the elbows are placed downward. And they tend to believe this is the key to “shrink the chest, straighten the back”. However, this will gradually block the Qi in lungs and the pulmonary functions will gradually decline. —Failure to rotate : Many exercisers do not move their waists which are rigid as steel plates. The waist will not move if it is not relaxed. And Qi will not be lowered to Dantian or ascend along the Du Channel. Therefore the kidneys will be strained if we lower the waist, flip the buttocks, and exert the waist too much. —Rigid or feeble knees : These are problems of the liver and tendons. Some people will have rigid or feeble knees when they stand or walk. This is related to wrong postures of the waist and hips. This is also a harmful movement. They do not even know why they knees hurt after such a long period of exercise. —Unability to stand or walk for a long time: These are problems of the bones and kidneys. The kidneys store essence, master bones, and generate marrow. Bones cannot be hard unless the kidneys are strong. Therefore, a correct stance is a very good health-preserving exercise. But too low and too long stances are not necessarily good. “Prolonged standing impairs bones”. Therefore improper stances will damage the bones. From the above we can see that proper exercises can strengthen the five Zang viscera. In other words, “if these organs are strong, the body will be vigorous. If these organs are weak, the body will be dead”.